Frida Kahlo was a Mexican artist whose art was influenced by her depression and her health issues. She was a great artist who lived a short life due to her health issues. At 6 years old, she was diagnosed with polio that left her with a limp in her left leg. Later in her life she went on a bus that collided with another vehicle. This accident left her with a broken hip, and fractures to her spine and pelvis. During her recovery, she started painting while she was in her hospital bed. After all her health problems, Frida ended up having depression, and the only way she found relief from her depression was through her art. One of her famous paintings showed “The Two Fridas” where there are two versions of her. One of them was dressed in white with a bleeding heart and the other was dressed in bold colors with a complete heart exposed. As her health issues got worse, she got an infection in her right foot. That caused the removal of her right foot which left her in a wheel chair. She died at the early age of 47 due to a blood clot in her lungs. 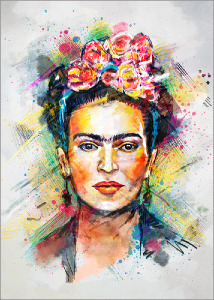 For her art and her determination, many people still remember Frida Kahlo today even though she passed away years ago.